Civil War goes a bit Wuthering Heights, and noone could be happier about that than me. It could be heard already on the previous album Gods And Generals (2015) and at least a few of the songs on this, their third album, continue to have strong resemblences to that band due to intricate melodies, sudden changes in tempo and dramatic twists and turns. Examples are Tombstone and to some extent during the intros, bridges and choruses also Deliverance and Savannah. During the first couple of spins this album felt a bit hard to digest, close to boring, but it's defintely a grower, but be patient. It takes a while for it to sink in but then it's quite good. It is a bit more epic and dramatic than previously and even though I am normally a fan of their, and in general the genre's, speedier songs the slower paced and epic songs are the better this time around. I wouldn't say that there are any major standout tracks as much as there are quite a lot of standout moments on this album: the anthem-like and amazingly gluesticking choruses in America and - especially - Gangs Of New York, the verses in Deliverence and Savannah, the interesting and catchy Tombstone, the grinding verse riff in People Of The Abyss. The album is packed with plenty of great parts and makes a good whole but never reaches the high division as a compact unit. There is good balance between the more uptempo tracks with chugging riffs and the epic ones with drama and big gestures, even though I feel the album loses a bit momentum around the mid section, and ends on a bit of a sour note as I had hoped way more for the title track. The galloping bonus track Strike Hard Strike Sure could easily have taken its place in the standard tracklist if you ask me. 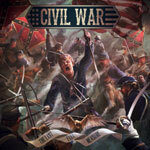 In hindsight, I have to admit I underrated the previous two Civil War albums a bit and today they both would rank a tiny bit higher and in fact, even though it is a very close shave, they are both slightly better as a whole than this album despite the fact that this has the best individual parts and is better and clearer produced. As usual, Nils Patrik Johansson (Astral Doors, Lions Share, Wuthering Heights) is the key element and an absolutely vital piece to the big picture, which goes without saying for followers of his work. An amazing voice that once again delivers flawlessly.